Sony has just announced two new interesting products in the form of digital recording binoculars capable of Full HD video recording, but what interest me more is the feature allowing you to also capture stereo 3D video with them. Of course binoculars are stereo 3D ready in terms of looking trough them as they do have two viewfinders, using small digital displays at their end in the case of Sony’s DEV-3 and DEV-5. You can say that these new digital recording binoculars are a lot like a 3D camera, but with two viewfinders instead of having a 3D display, their features are actually not that different when compared to Sony’s HDR-T10 3D camcorder. But you should still have in mind that these digital binoculars have a different purpose and should not be considered as a possible replacement for a 3D camera/camcorder. Both DEV-3 and DEV-5 digital binoculars are capable of recording in 2D mode with 1920×1080 resolution in 60p or 50p, 1920×1080 in 60i or 50i as well as 1440×1080 in 60i or 50i. In stereo 3D mode you will be getting 2x 1920×1080 resolution with 60i or 50i and you can also take still pictures (apparently 2D only) with resolution of up to 7.1 megapixels (effective, not interpolated). 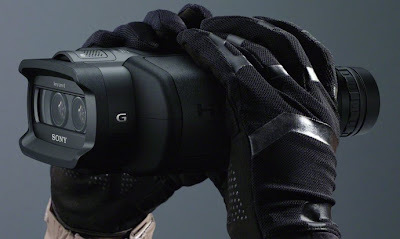 These digital binoculars use Dual Sony G Lens F1.8 – F3.4 and two 1/4 type (4.5mm) back-illuminated Exmor R CMOS Sensors and feature Optical SteadyShot image stabilization with Active mode. They are recording the photos and videos on Memory Stick PRO Duo (Mark 2) / Memory Stick PRO-HG Duo or SD/SDHC/SDXC flash cards only as they do not have built-in memory. You also get an mini HDMI output on the binoculars for previewing what you’ve recorded on a 3D HDTV. Unfortunately there is no information yet available regarding the interaxial distance for the DEV-3 and DEV-5 binoculars as this is something important for the recording of 3D video, especially considering the fact that you’d be most likely recording more distant objects like wildlife animals for example (unfortunately it doesn’t look as much from the photos). So what is the difference between the DEV-3 and DEV-5, not much actually. The DEV-5 offers a few extra features, but not that much actually, you get a GPS, an extra x10 digital zoom mode for a total of x20 zoom in movie mode (x10 is the standard optical zoom you get), and double the optical zoom in photo mode to up to x15/x20 vs x7.5/x10 on the DEV-3 (x5.4 zoom is the maximum in 3D mode). And as a last difference you get a few more extra accessories, if you ask me definitely not enough to justify the $600 USD difference and there should be an even more expensive pro version of the DEV-5 called DEV-5K with the same specs, but that will also include a faster charging adapter and higher capacity battery. The new Sony DEV-3 and DEV-5 digital recordable binoculars are expected to be available in November 2011 with a price of about $1400 and $2000 USD, respectively in US and most likely the same numbers but in Euro for Europe.